In the food-packaging business, polystyrene has become a four-letter word. That petroleum-based environmental havoc-wreaker — often referred to as Styrofoam — has been largely phased out by Bay Area restaurants and foodservice companies in response to a consumer base that has demanded a commitment to sustainability. Gone are the days when your Big Mac was served up in a bright yellow foam clamshell. Despite all of this, polystyrene has managed to keep a foothold in an unlikely place — the supermarket. Just a few aisles down from the organic produce and reusable fabric tote bags are eggs nestled in polystyrene cartons, and shelves stacked with boneless chicken breasts, T-bone steaks and almost all the other cuts of meat living their lives shrink-wrapped, resting on polystyrene trays. Why does polystyrene thrive? Simply put, it works really well. It’s light, sturdy and doesn’t wilt or soften despite housing perspiring meats for days. The food industry simply doesn’t have a cost-effective, eco-friendly answer to the plastic that Dow Chemical introduced to Americans in the early 1940s. In 2007, Richmond business owner Allen King thought he had the answer. After nearly 25 years of working in conventional retail and industrial packaging, King saw the tremendous potential for green foodservice alternatives. He decided to strike out on his own in 2004, creating Excellent Packaging and Supply, partnering with numerous manufacturing companies to bring sustainable foodservice products to the marketplace. King has dubbed this dedicated line of fully compostable products BioMass Packaging. A particular manufacturer that King worked with had successfully developed a foam made from polylactic acid, or PLA, that’s derived from renewable resources like corn starch and sugar cane. It looked just like those polystyrene meat trays, but was fully compostable. The meat markets baulked for two important reasons. For one thing, the new trays were still too expensive. But just as importantly, the compostable trays looked too much like the polystyrene ones. The meat markets would be paying more for an eco-friendly product without customers even knowing. It just didn’t make any sense. Earlier this year, King got another chance. A China-based manufacturer created a tray made almost entirely from the fibers of bulrush, a marsh-growing reed. According to King, the new trays performed just like the polystyrene trays and were not overly expensive. He once again shopped around his new find and this time there was interest. Sunshine Grocery in St. Helena, in Napa, agreed to purchase them. Whether the bulrush trays will catch on with other grocers is an uncertainty that King has learned to live with. Excellent Packaging and Supply sends its BioMass Packaging products to businesses all across the country, from the Marriott Hotel down the street to the cafeteria of a large oil refinery in Louisiana. King partners with between 50 and 80 manufacturers located across the country and across the globe, with many situated in China. These diverse relationships allow him to act faster than larger, more conventional food packaging companies, giving him an edge in marketing new, green products and catering to the needs of individual businesses. In 2005, Cal Dining, the company responsible for purchasing food and food packaging for the UC Berkeley cafeterias, wanted to go green. Cal Dining wanted to start by offering compostable take-out trays for students to replace their Styrofoam trays. Their current supplier had one, but it was flimsy, and Cal Dining feared it wouldn’t hold up, and so contacted King at Excellent Packaging. King had a prototype made. Cal Dining liked it, but said it was too thin. King had another prototype made, beefing it up. 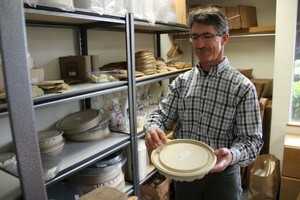 This tray passed muster, and would become the first compostable product offered at UC Berkeley. King continued to introduce more and more products, and after almost four years, the entire UC Berkeley cafeteria system went from not having a single green item to being 100-percent sustainable. At around the same time, a similar situation was brewing with technology behemoth Google. Without any connections to the company, King tracked down the email address of Google’s then head chef Charlie Ayers and emailed him, telling Ayers about his company’s line of green products. Today, Excellent Packaging no longer counts UC Berkeley or Google as clients. This has become somewhat of a pattern. King says it’s only natural that larger food service companies have reclaimed businesses that switched to smaller, more nimble companies like King’s. Since 2005, the marketplace for green foodservice products has widened immensely, allowing larger competitors to offer more green products at a price point that Excellent Packaging can’t match. King sees his company less as a direct competitor to the larger, established food service companies and more as an innovator pushing his industry towards a sustainable future. “Part of our role is advocacy in the marketplace,” he said. This niche role as innovator has even taken King outside the realm of business. King worked with the Richmond Mayor’s Office, helping to draft the city’s 2010 ordinance requiring that all disposable food ware, with few exceptions, be compostable. He provided compostable sample kits to restaurants to facilitate the switch, and even worked side-by-side with the recently closed Safeway on Macdonald Avenue to transition away from Styrofoam products. The tough economic times of late have taken a bite out of Excellent Packaging’s bottom line, and have hurt the willingness of some businesses to pay more for green products. But, King says, despite the cost, there are still many businesses that have made a commitment to stay green. And as for the fate of polystyrene meat trays? King plans to partner with an East Coast facility currently being built to produce an approximation of the bulrush tray using plant fibers from American agricultural waste products. Polystyrene egg cartons are on notice, too.